Lightened hair from bleaching tends to take on unwanted yellow and brassy tones, leaving the hair color uneven. Normally, a toner is used after bleaching to remove these tones and deposit a sheer layer of color over bleached hair. 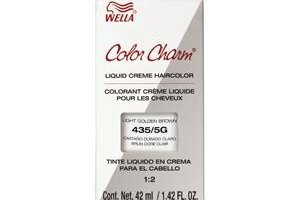 If the hair is not light enough, toners will not take effect. Bleaching hair again can cause much more damage, so doing a quick soap cap is recommended. Soap caps remove unwanted color and tones from hair in a quick 10-minute session. Wash your hair with a purple-based shampoo. Lather your hair completely and leave the shampoo on for at least three minutes. Rinse it out thoroughly, squeeze out any excess moisture and apply a purple-based conditioner. Leave this on for about five minutes and rinse it out. Towel-dry your hair and style it as usual. Use these products one to two times a week to keep away unwanted yellow tones. Do a soap cap to remove unwanted hair colors. 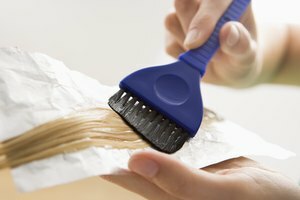 Mix an equal amount of 20 volume developer and shampoo in a plastic applicator bottle and apply the solution to the yellow portions of towel-dried hair with gloved hands. Leave the soap cap on for about 10 minutes and rinse it out. If there are still yellow portions, repeat this process. Wash your hair with a clarifying shampoo, working it into the hair and scalp completely. Scrub your hair with your fingertips to remove any product build-up, dirt, smoke and oil. Cigarette smoke can sometimes cause yellowing of the hair. Using a clarifying shampoo once a week will help to remove all the elements left behind in your hair. Tracy Moore holds a bachelor's degree in communications with a minor in graphic design. She has extensive experience using graphics software in her professional and personal life. She also writes a column for a local newspaper on the latest technology developments.